No one likes to drive a damaged car, but many people are forced to do so out of concern for the costs associated with fixing it. If you have a car that has scratches and dents and you are looking for reliable car painting, we can help. If you are worried about the car painting cost, you will appreciate our auto paint shop estimates. This will give you an idea of how much it costs to paint your car, and you can even compare our auto paint shop prices with others to ensure that you are getting a good deal. Accidents and collisions can happen anytime and anywhere, but not every auto body shop is capable of repairs and car painting. When you use our services, though, there is nothing to worry about. 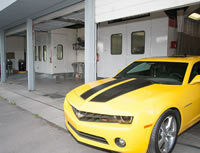 We offer superior collision damage repair and car painting services in Federal Way. With us as their chosen auto paint shop for car painting, Federal Way clients can expect the best quality services at the most reasonable prices. Equipped with the best quality machines and equipment, our technicians put in their best efforts to restore your vehicle to its original condition. To maintain the look of your car or truck, you have to take great care to wash it and prevent damages from dents and scratches. We offer superior quality auto painting services in Federal Way in the event that something still manages to mar the look of your vehicle. If you are looking for a reliable auto paint shop that can handle repairs and auto painting in Federal Way, you can contact Lakewood Auto Body at 253.581.0220.